Low phosphate and high calcium concentrations have been linked to altered glucose tolerance and reduced insulin sensitivity in non-diabetic individuals. The aim of this study was to examine the relationships of calcium and phosphate levels and the calcium–phosphate product with the development of type 2 diabetes. Participants were 863 African-Americans, Hispanics and non-Hispanic whites in the Insulin Resistance Atherosclerosis Study who were free of diabetes at baseline. The mean follow-up period was 5.2 years. The insulin sensitivity index (SI) and acute insulin response (AIR) were directly measured using the frequently sampled IVGTT. Calcium concentration (OR per 1 SD unit increase, 1.26 [95% CI 1.04, 1.53]) and calcium–phosphate product (OR 1.29 [95% CI 1.04, 1.59]) were associated with incident diabetes after adjustment for demographic variables, family history of diabetes, and 2 h glucose. 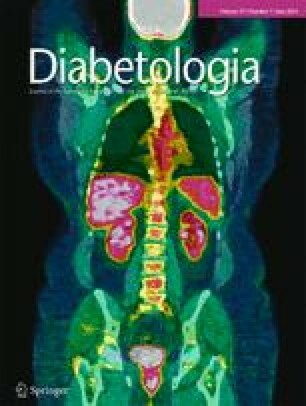 The relationship between phosphate concentration and progression to diabetes was close to statistical significance (OR 1.21 [95% CI 0.98, 1.49]). Calcium concentration (OR 1.37 [95% CI 1.09, 1.72]) and calcium–phosphate product (OR 1.39 [95% CI 1.09, 1.77]) remained associated with incident diabetes after additional adjustment for BMI, plasma glucose, SI, AIR, C-reactive protein, estimated GFR, diuretic drugs and total calcium intake. Elevated serum calcium and calcium–phosphate product are associated with increased risk of developing type 2 diabetes independently of measured glucose, insulin secretion and insulin resistance. Future studies need to analyse the role of calcium–phosphate homeostasis in the pathophysiology of diabetes. Steven M. Haffner is a retired Professor of Medicine, University of Texas Health Science Center. The online version of this article (doi: 10.1007/s00125-014-3241-9) contains peer-reviewed but unedited supplementary material, which is available to authorised users. This study was supported by National Heart, Lung, and Blood Institute grants HL-47887, HL-47889, HL-47890, HL-47892 and HL-47902, and the General Clinical Research Centers Program (NCRR GCRC, M01 RR431 and M01 RR01346). CL contributed to the conception and design of the study, analysis and interpretation of data and drafting the article. AJH and MJR contributed to the analysis and interpretation of data and revised the manuscript critically for important intellectual content. SMH contributed to the acquisition of data, conception and design of the study, analysis and interpretation of data and drafting the article. All authors gave final approval of the version to be published. CL is responsible for the integrity of the work as a whole.